Coin has two sides, the computer has vulnerabilities on the other hand show benefits. Why, it provides a influence effect causes people found out resolution.And such a way go to advanced technology zone. Security announcement by Adobe urge adobe users following the requirement apply the fix. Since there are total 5 items of security update. The item which bring my attention is the phonegap push plugin vulnerability (CVE-2018-4943). PhoneGap Push plugin that brings support for Firebase Cloud Messaging (FCM) to Apache Cordova apps on iOS and Android since PhoneGap Push Plugin version 2.0.0. 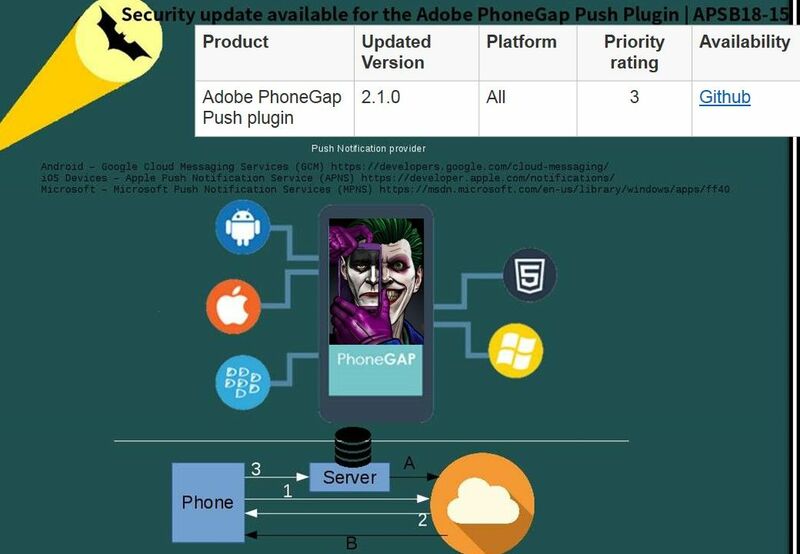 There are few vulnerabilities not related to phonegap push API but need to aware!